In the Flash Season 2 Episode 6 we have The light pictured above, who Zoom had sent to kill The Flash, in the Star Labs Meta human makeshift prison. There is still an air of doubt surrounding the new Mr Wells. When we see flashbacks of Mr Wells from Earth 2 we see that he has a sinister side which even his daughter sees. We see Barry’s affection for Patty growing. 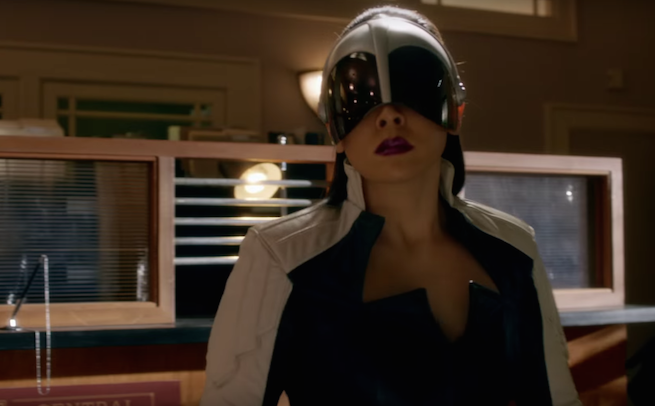 Dr Light uses her powers to hack into the Star Labs computers and turns invisible which helps her to escape. So the makeshift prison is not as impenetrable and as Dr Lights powers are not exactly the most powerful. So it would mean many others would be able to escape… Time to step the confinements up a notch. Based on previous series we know that what happened with Dr Wells would make it difficult for the flash team to trust the new one from Earth 2. But we know its not the same Dr Wells, also the flash team knew that in series 1 the Dr Wells Was an imposter, it was actually Eubard Thorne (the Reverse Flash) so in fact they never actually met the real Dr Wells of Earth 1. There fears and doubts are thus not based on solid grounds, Maybe they just get a bad vibe off him. In this episode we see bit more of Iris but she is shown as more stable and in control. When with Barry with just good friends no real chemistry. Iris helps construct a plan to trick Zoom by using Linda (who is the Earth 1 doppelgänger Dr Light). They try to train Linda to be like Dr Light and the scene is humorous…. With Linda almost killing Cisco with the light beams fired from her palms. In order to boost Lindas confidence The Flash decides he needs to reveal himself to her. She is surprised but I think there’s a little under acting here. The scene where Dr Light (fake) tries to fight The Flash and steal his ‘badge’ to lure Zoom out is laughable! The fake acting is terrible…. They dont manage to trick Zoom, but they tried, leaving Dr Wells and others angry. We see The Flash unmask in public in the docks, where there is a chance of being seen and others coming through the portal, which is a bit careless Mr Super Hero. The Flash encounters and tries to take on Zoom. But we see that Zoom is much faster and more powerful than The Flash. However he tries all his powers. When we see Zoom catch Flash’s lightning bolt and throw it back at him we know The Flash is no match at present for the Zoom and he gets his backside kicked. He takes a good beating leaving him hospitalised. We end with him not being able to feel his legs. 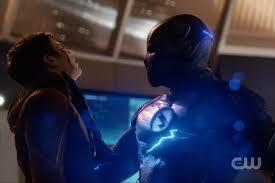 Well With Dr Wells knowing how powerful Zoom is and giving a few warnings the team doesn’t really prepare that much nor do they devise any plans or weapons (except the slowing down serum, but to use this they would have to catch up with Zoom…), so they go into the head on fight with a disadvantage. Surely this can not be the end of The Flash, unless he is going to be the fastest man on a wheelchair… We know his healing bit like Wolverine from X-men is faster than most humans so we look to see if his powers are able to heal from this disability. Overall a good episode where we get to see what could be The Flash’s nemesis and possible the end of The Flash!